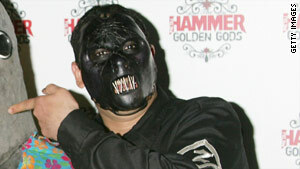 Paul Gray of Slipknot appears at the Metal Hammer Golden Gods Awards in the United Kingdom in 2005. Band won Grammy in 2006 for best metal performance for "Before I Forget"
(CNN) -- Paul Gray, the bassist for the Grammy-winning metal band Slipknot, was found dead Monday morning in his Des Moines, Iowa, hotel room, according to police. He was 38. Gray's body was found by staff members at the TownePlace Suites, said Sgt. Dave Disney of the Urbandale Police Department. An autopsy, including toxicology tests, will be performed Tuesday, Disney said. Gray was arrested in Iowa in 2003 on drug possession charges when police found small amounts of marijuana, two syringes and a substance that field-tested positive for cocaine after he was involved in a wreck with another motorist. Slipknot -- whose fans are affectionately known as "Maggots" -- was formed in Des Moines in late 1995 and became immediately recognizable for the dark and often grotesque homemade Halloween masks its nine members wore on stage. The band won a Grammy award in 2006 for best metal performance for "Before I Forget." Slipknot's self-titled debut album went platinum in 2000. Its fourth album, "All Hope is Gone," spent 69 weeks on Billboard's Top 200 charts, debuting at No. 1 its first week in 2008.